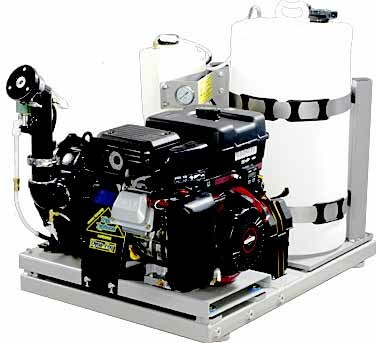 Curtis Dyna-Fog, the world's leader in aerosol applicator technology, introduces the Typhoon ULV applicators. These ULV applicators have been designed to be compact, rugged machines with the same high standard of uniform droplet formulation as our other models. The high quality of the components ensure low maintenance cost, all at an attractive purchase price. A DYNA-FOG Typhoon ULV is an effective way to control environmental pests and reduce insect borne diseases like encephalitis, dengue fever and malaria. Whether you are a long time user or first time user of Curtis Dyna-Fog, you will appreciate the attention to detail and convenient location of all components. Shock absorbing pads that help cut damaging vibration to an absolute minimum. High volume, positive displacement, rotary blower with corrision resistant silencer. Direct-drive blower eliminates the need for belts. Rugged, translucent. cross-linked polyethylene tanks that resist corrosion and vibration damage for maxi-mum durability. Easily removed for cleaning. All components that come in contact with formulation are corrosion resistant. No chemical flows through vehicle cab. Liquid-filed air pressure gauge for monitoring nozzle air pressure. Remote Choke Control: Electric on Typhoon I with gear pump. H.V. Boom for full 360' horizontal and vertical adjustment. 9 HP Briggs & Stratton Vanguard, OHV4-cycle engine with electric start and back-up manual rope start, oil alert, digital tach and hour meter. High efficiency Multimist nozzle, easily adjustable and removable. 15-gallon (56 lt.) formulation tank with lockable cap. 1 gallon (3.8 lts.) flush tank, with lockable tank cap. Pumping system: Gear 0-20 oz/min. Diaphragm 0-128 oz/min.